The mystery of a 150-million-year-old feather has finally been solved — least partially: it didn’t belong to Archaeopteryx, but its owner remains elusive. The isolated “Archaeopteryx” feather is the first fossil feather ever discovered. The top image shows the feather as it looks today under white light. The middle image, the original drawing from 1862 by Hermann von Meyer. Bottom image is Laser-Stimulated Fluorescence (LSF). Note how the quill is not visible today, but clearly visible in the original drawing. LSF imaging showing the halo of the missing quill. Scale bar is 1cm. Image Credits: The University of Hong Kong. The discovery of the first Archaeopteryx fossil in 1860 was a pivotal moment for both biology and geology. It showed a transitional creature, a link between dinosaur and birds, confirming what many scientists were already starting to support: that birds evolved from lizards. This 150-million-year-old creature fits like a charm into these theories and is still crucial for our understanding of evolution. But just before Archaeopteryx was discovered, a single, elusive, fossilized feather was uncovered. To this day, this is the oldest feather we’ve ever discovered. This feather was thought to belong to an Archaeopteryx and even used to name this creature — but it might not have belonged to Archaeopteryx at all. Right from the start, there were some doubts. 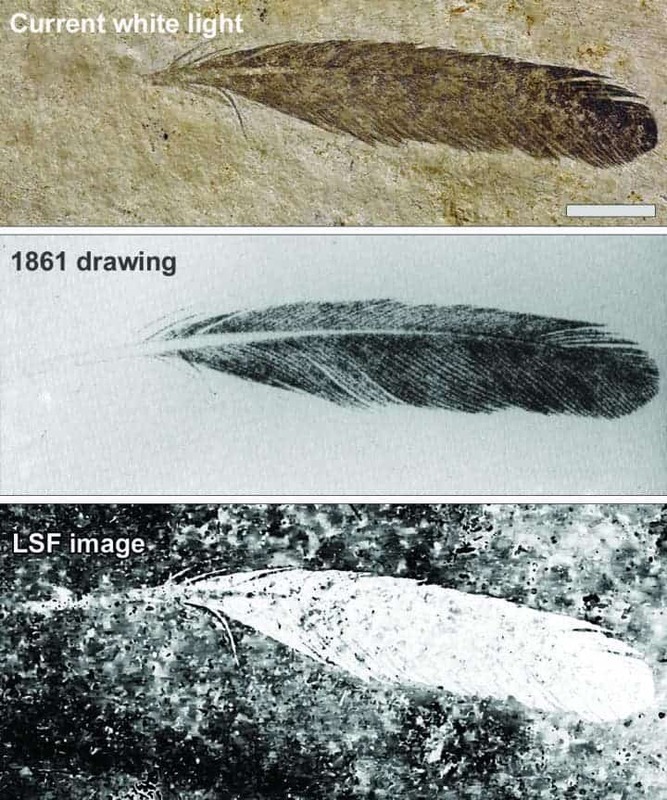 Initial descriptions of the fossil mention a rather long quill visible on the fossil, which would indicate that it is a primary feather. However, the quill is no longer visible today, and has not been for a long time. There have been several attempts to uncover the missing quill with imaging techniques, but none found anything. So was the quill still there? Researchers have now used a novel imaging technique called Laser-Stimulated Fluorescence (LSF) to analyze the fossil. LSF revealed the missing quill (or rather, its remaining halo), settling the old mystery. “It is amazing that this new technique allows us to resolve the 150-year-old mystery of the missing quill,” says Daniela Schwarz, co-author in the study and curator for the fossil reptiles and bird collection of the Museum für Naturkunde, Berlin. But the method also dethroned an idol: it most certainly did not belong to Archaeopteryx the team says. LSF allowed an unprecedented view into the structure of the feather, revealing the lack of a distinct s-shaped centerline, a defining characteristic of covert feathers. The team also ruled out the possibility that it could be a primary, secondary, or tail feather. A 2011 study found that Archaeopteryx was almost certainly black. 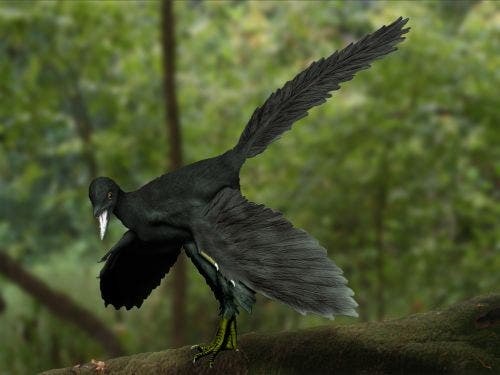 This is an artistic reconstruction by Nobu Tamura, showing what the bird might have looked like. So if it didn’t belong to Archaeopteryx, then who did it belong to? Well, researchers aren’t really sure, but it was probably another feathered dinosaur. The fact that such a creature exists suggests that there was much more diversity in feathered dinosaurs than we originally thought. Archaeopteryx remains a key link in dinosaur-bird evolution, but maybe it wasn’t all that unique — and maybe several other creatures boasted similar features. It’s remarkable how new techniques enable us to study ancient creatures. We will definitely be hearing more of LSF in the future, researchers conclude. “The success of the LSF technique here is sure to lead to more discoveries and applications in other fields. But, you’ll have to wait and see what we find next!” added Tom Kaye, the study’s lead author. Archaeopteryx lived in the late Jurassic, some 150 million years ago. It had more in common with dinosaurs than birds (jaws with sharp teeth, three fingers with claws, a long bony tail, hyperextensible second toes), but it still exhibits definite bird-like features, such as its broad, feathered wings. The paper ‘Detection of lost calamus challenges identity of isolated Archaeopteryx feather’ by Kaye, M. Pittman, G. Mayr, D Schwarz and X. Xu, has been published in Scientific Reports.